Cleveland House was entirely rebuilt in the 1790s by Francis Egerton, the third Duke of Bridgewater. Egerton assembled a collection of paintings there. His nephew, who became the Marquess of Stafford in 1803, inherited the house and continued the restoration, adding to the collection, which he opened to the public. The house was demolished in 1840-1 after it was inherited by the Duke's second son and found to be in a dangerous condition. Bridgewater House was built on the site. 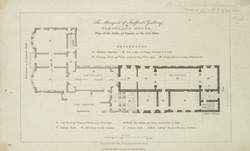 This plan shows the gallery and includes an alphabetic key to the different rooms.